Growing carrots in my home garden has been difficult for me. Keeping the soil well drained, and loose. Adding lots of compost and turning it regularly into the soil. Plant 2 rows at a time, then use the succession planting method to maximize your harvest. Canning carrots makes for a quick, easy to fix roast beef or other side dishes. It’s also one of the easiest ways for storing carrots long term. I don’t have a lot of freezer or fridge space, so learning how to preserve carrots in jars is the best way I have found for what to do with all my garden carrots. Using canned carrots as a quick and easy side dish is as simple as heat and eat. Canned carrots, heated with a bit of butter and brown sugar can be an instant “treat”. Canning carrots with brown sugar is not recommended, but adding this when you heat and serve the carrots. Ok, here’s how you can preserve carrots by canning. Peel the carrots and rinse. Save the peels for broth/soup later, if you can. Our rabbits also enjoy them as their treat if I’m not fast enough to put them away. You can leave them whole, slice them, or dice them. I prefer to cut mine into coins. 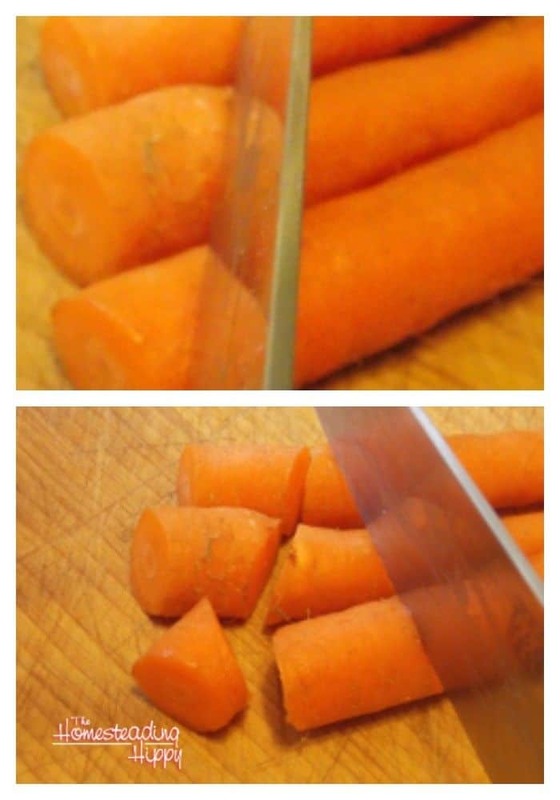 To cut carrots into coins, lay several carrots on a cutting board at once, and use a sharp knife. Alternate angles in how you cut them, and viola! Carrot Coins! This method will also work with canning baby carrots. Simply leave whole. To raw pack , or cold pack, the carrots, simply place the raw carrots in a hot, clean jar. Add boiling water on top, leaving 1 inch of headspace. Wipe the rim with a clean towel, add new lid and clean band, screwed on finger tight. Process in a pressure canner at 10lbs pressure pints 25 minutes, quarts 30 minutes. Allow canner to cool on it’s own. Remove jars from canner, allow to cool in non drafty area for 24 hours. Any jars that didn’t seal need to be refrigerated and used within 3 days. Wipe jars that sealed with a damp cloth, and store in the pantry for up to a year. Sometimes the question comes up, “Can you water bath carrots?” and the answer is a resounding NO. Carrots are naturally low acid, and the temperature of 212 degrees is NOT high enough to kill the botulism. I know that Grandma may have done it, but since bacteria has changed, the soil is different, please just don’t try it. Your health and safety are not worth the risk. 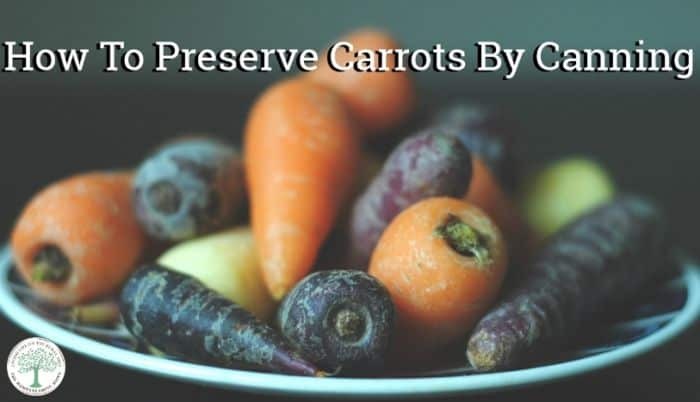 What is your favorite way to preserve carrots? Will you try canning carrots this year? Be sure to pin this to your favorite board for later!